I got my Happy and Scrappy Quilt from the Quilt-Along finished. How about you? Do you have yours done? I used mine to play with some fun designs on the quilting, doing a little practice to see if I like them or not. Some of them I like, and some of them, not so much. I quilted a straight line in between every row, and then filled in with my various designs. We’ll start at the top, and I’ll show you what I did. Wild and crazy feathers on the very top strip. They’re OK, but not my favorite. 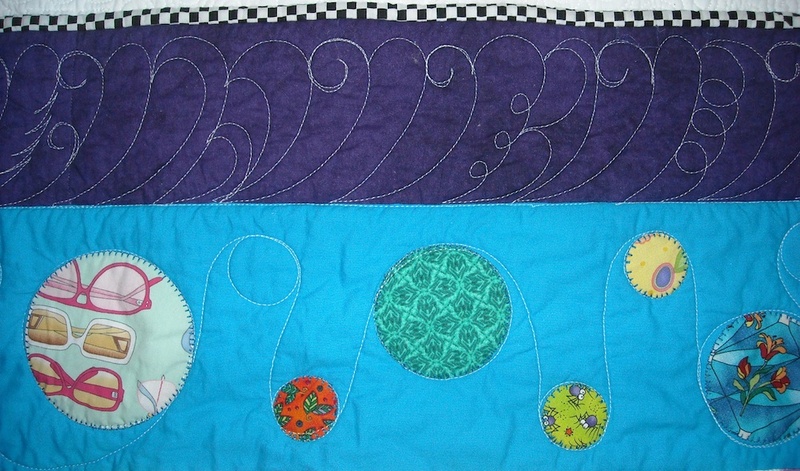 I quilted big loops among and around all the appliqued circles. I’m really wishing I’d done something else in those. Not liking that part. I quilted X’s through all the squares in the row of 4-patches. Fun and easy, and I think these came out really cute. Squiggly lines in all the narrower strips. I like doing these, and they’re a way to quilt down strips that need a little something, without quilting them too heavily. 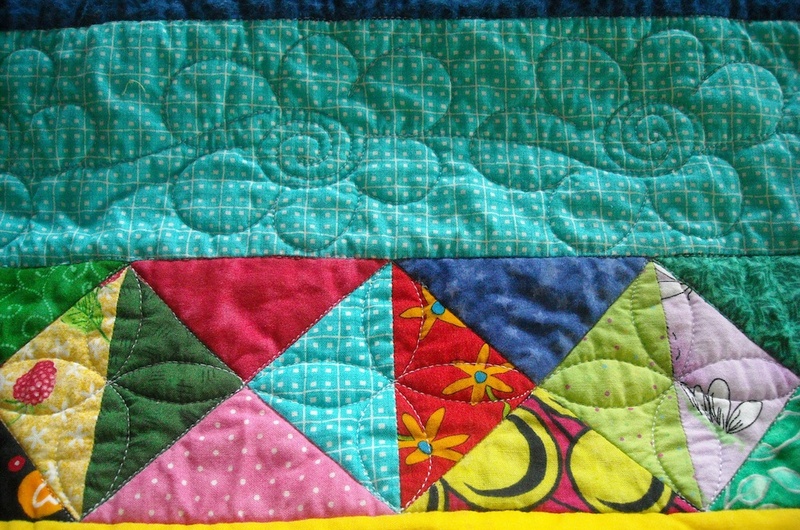 In the plain wide strip above the hourglasses, I quilted some fun free-form flowers with swirly centers. They came out OK. And in the hourglasses, I ditched all the triangles, and put petal flowers in between them where they connect. I think that came out all right, too. At least I’m not disliking it! 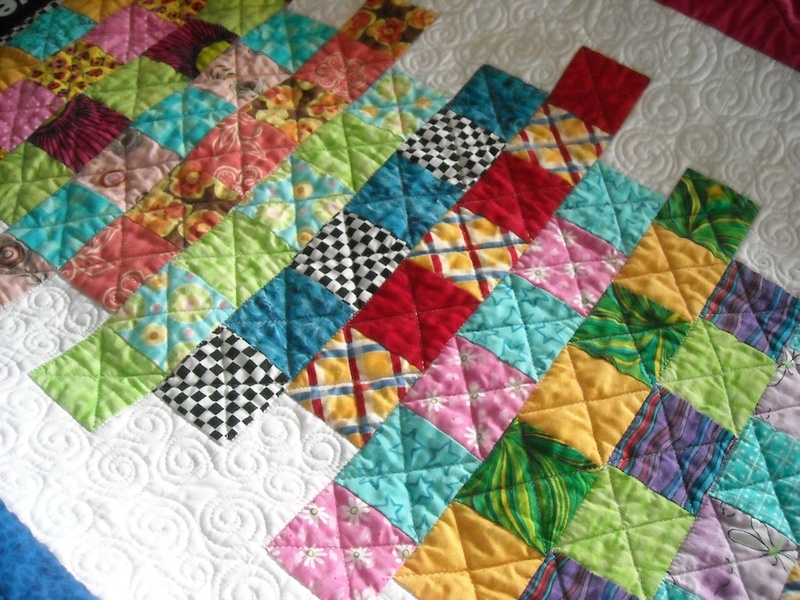 My favorite part of the entire quilt is what I did in the large patchwork sections. I filled in the background with swirls, and quilted an X in each separate square. It was fun, and I like the way it looks on the front, and on the back. In the very bottom strip, instead of a squiggly line, I changed it up a bit, and put loops. Also fun, and easy, without being too heavy. 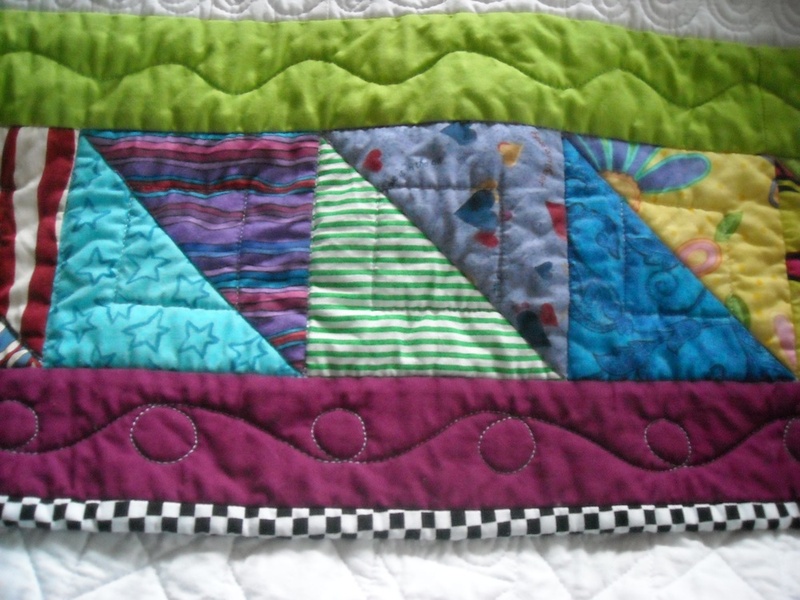 Another of my favorite designs is the inner squares I quilted in the larger half-square triangles shown above. I quilted down the diagonal line, stopped a little ways in to do the square, then continued on down the diagonal line. Then I quilted UP the line in between the squares. This way I was able to quilt the entire row of units without having to stop. 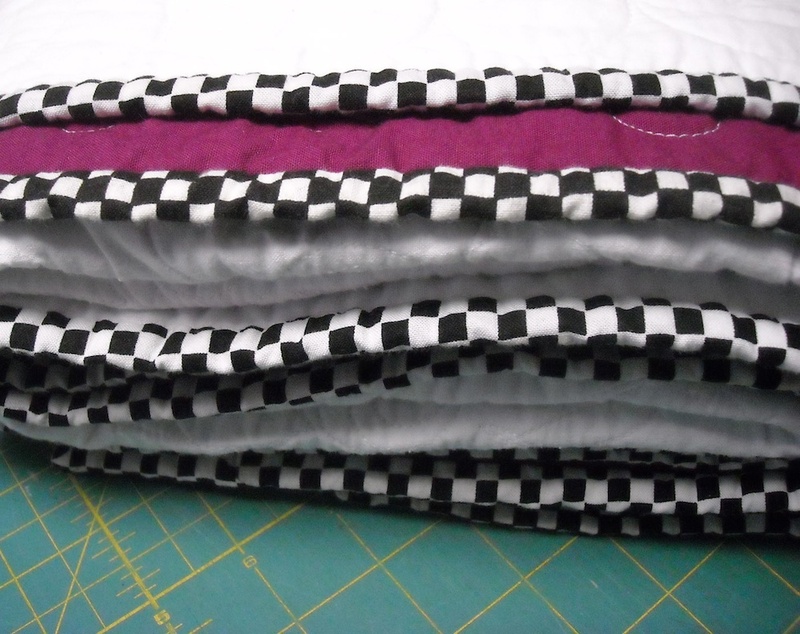 For my binding, I chose a black-and-white checkered print. I was really trying to use up whatever I had in my stash. Can you tell I actually had to use two different black-and-white checkered prints? I didn’t have enough of the first one, so I had to use some from another piece, and it was just a little bit different. Truly scrappy! If you haven’t yet quilted your Happy and Scrappy quilt, I hope this gives you a few ideas for how you can have fun with it. Now that I’ve washed and dried mine, and it’s all crinkly, I just love it. It’s a dreary old day here, with gray skies and spitting snow, so I really wanna go get in my sewing chair and snuggle up in it while I do some hand stitching. Maybe I’ll even make a cup of hot chocolate, too. And if a nap overtakes me, well, then . . . . Thanks for showing so many great ideas on quilting it. Love those free-form flowers and petal flowers! I have the top done and my daughter and I both love it. She has picked out some minky fabric for the back, so think I may have to hand tie it, as it may be too thick for my machine. It’s been a super fun project to do with her. Thanks so much and hope you have a wonderful Thanksgiving! Thank you so much for this quilt. I was looking for use of my scraps and what a beautiful project. 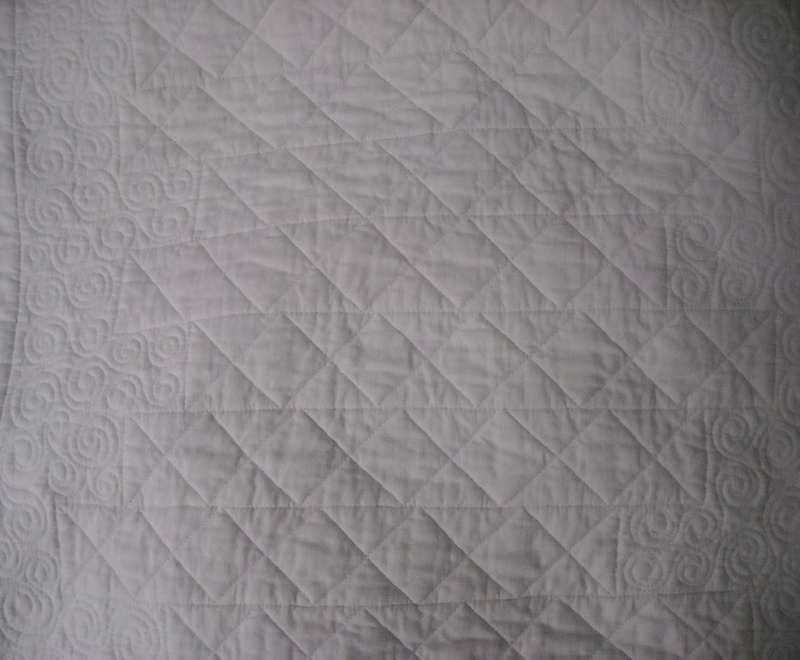 I finished quilting it last week and have been using it ever since. My favorite.